Are you looking forward to spend your dream holiday in an exceptional Villa situated in a splendid and natural environment with two magnificent sand beaches just next to you !Look no more because you’ve just found yourself one ! “BAHIA RINCON “ is what you are looking for !PLAYA COLORADO and its immediate PLAYA RINCON are absolutely the most beautiful beaches in the Dominican Republic. One is in front of you and the other one is just next. Both of them awaits you. Enjoy the shade under the palms and swim in a the blue sea that shades into green. 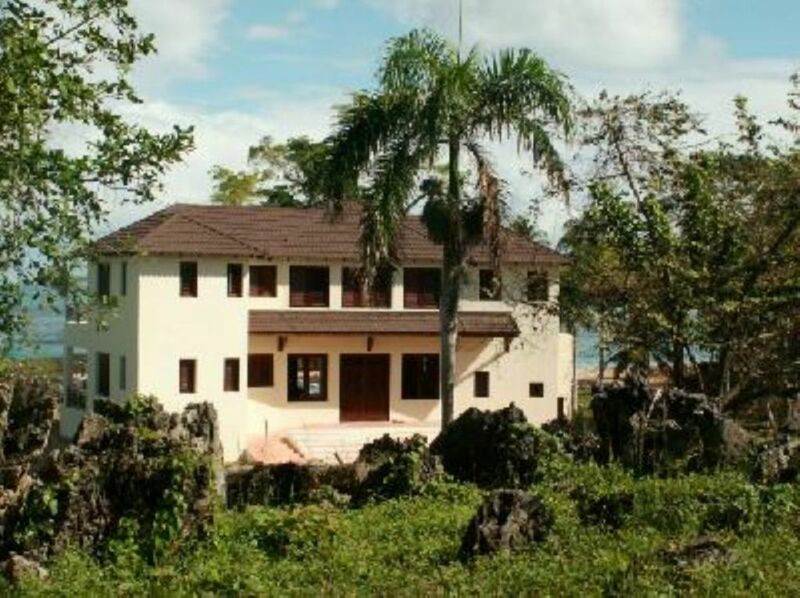 Our colonial style villa is situated in a place of total security and in a very beautiful tropical park. Enjoy the comfort of each bedroom with its private bathroom and toilet, its large balcony with a nice ocean view. The living-room and the dining-room in the covered exterior terraces with the tropical wooden deck around the swimming pool (9m X 6m) allows you to live inside or outside as you like it. An American kitchen is well designed to bring all the happiness you hope. N .B:There is an access and a well designed bedroom for the handicapped..IMPORTANT INFORMATIONAnimals not admitted, no smoking area, personal transport required. Beautiful house and grounds. Very private and quiet except for the waves crashing on the beach! This is a great location for a group of people who want a great place to meet. The beach was too rough for swimming but we were able to go to nearby beaches to swim and the pool is wonderful. At night we would turn off all the lights and lie on the chairs to watch the stars. There are not many places you can do that anymore. We even saw fireflies which I have not seen since childhood. We went to sleep every night with our windows open and the sound of the surf lulling us to sleep! The night watchman was there all night to keep a good eye on the area as we slept. So relaxing! The house is well set up for cooking and relaxing and the staff are great. The road in is rough, but with careful driving we were able to manage and got quite good at driving it. We took great day trips to the local towns and beaches and happily came home every night to our wonderful house. Its a true paradise. Will come again with the family in aug 2018! Well managed and clean. Invaluable help from the crew; house manager: Diogenes, housekeeper: Duly and house security: Noe... very helpful on all your needs and wants! Villa Bahai Rincon - absolutely superb, a privilege to stay in such an amazing place! We had a fantastic time staying at Villa Bahai Rincon!! The setting is remote, but stunningly beautiful, a tropical paradise! The white sandy beaches, lined with coconut palms are spectacular and only accessible from the villa or by boat. The villa sits in very well kept tropical gardens with views out to the beach and bay beyond. The villa is large, beautiful colonial style and very well managed. We were very comfortable. The pool is excellent, large, very clean and very refreshing. Samana is fascinating, never a dull moment...., but always friendly. I'd recommend the zip wire, boat trips, the waterfall and some of the local beach front or hill top restaurants are fantastic. There is a great beachfront restaurant a short walk from the villa. If you like horse riding or quad bikes, there are plenty of opportunities. Hiring a good SUV is essential, driving is an interesting experience, you won't get to the best places in an ordinary car. Also Spanish is useful, there is very little English spoken, although we got by none. To sum up, we had a wonderful time sampling life in Dominican Republic, with a few adventures along the way and staying in a breath-taking location. We would go back in a heartbeat!! Fab!! y plane: International airports: Samana El Catey, Puerto Plata, Santo Domingo. y car: Samana and Las Galeras direction. Before Las Galeras (about 15km from Samana), take Playa Rincon Road to your left. From Los Tocones village, take right to Colorado Bay road (road sign),At the end, a paradise that you merit, awaits you !